After residents of DeKalb County, Georgia actively opposed plans by T-Mobile and AT&T to build telecommunications towers on the grounds of eight local public schools, Georgia State Representative Karla Drenner stepped up to the plate to help out. Rep. Drenner introduced HB 1197, “Cell Phone Towers in DeKalb County,” that would ban placing cellphone towers on public school grounds unless the cellular carrier can show that there is an absolute need for the tower, and that the location sought on school grounds is the only location that can adequately provide service to satisfy that need. Sixteen out of 18 DeKalb County representatives signed on to support the local bill. Support for the measure crossed political, racial and geographic lines. Citizens in favor of the bill also got support from all of their county commissioners and collected over 1,200 signatures on petitions supporting the measure — an admirable number considering Chuck Sims’ represents a county of only 380 people. A legislative committee heard three hours of testimony about the bill over three days at three separate state hearings, and not one person showed up to say they were in favor of plans to put the towers on school grounds. With support like that, the bill should have passed easily through the committee and moved to the House floor. But it didn’t. Why? Because the committee was headed by State Rep. Chuck Sims (R) of Ambrose, Georgia, a member of the American Legislative Exchange Council (ALEC), which is heavily financed by telecomm companies and which puts legislators in close touch with telecomm lobbyists. After the lobbyists showed up at the hearing, Sims declared the bill illegal under the FCC Telecommunications Act of 1966, even though similar legislation has been passed in California and New York. According to witnesses at the hearing, Sims then met with his “advisors” and then produced a non-binding resolution that tried to trick voters into saying they want the towers on school grounds, despite zoning regulations in place to protect the citizens’ health and property values. 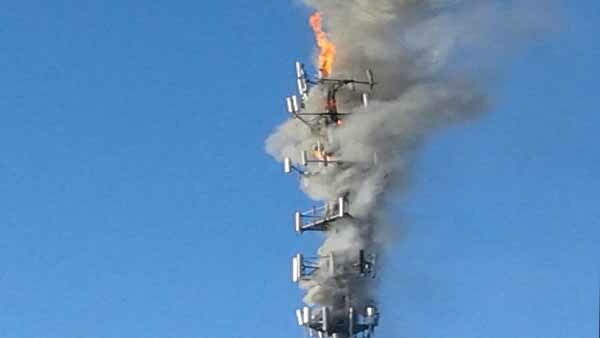 Parents are concerned about locating cell phone towers on school grounds because the towers contain hazardous materials known to catch fire, and cell towers occasionally fall over. Workers who climb the towers to maintain them fall or become injured frequently enough that cell tower climbing has been called one of the “deadliest jobs in the United States.” The rate of accidents among cell tower workers is higher than the injury rates for coal miners, offshore fisherman or loggers. Between one and four cell phone tower climbers die every month. 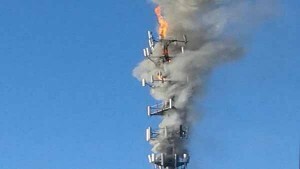 Cell phone towers also require backup power sources that typically involve gas, diesel or propane-powered generators, with accompanying fuel tanks or batteries that contain large amounts of sulfuric acid, another safety hazard. Thank you for taking an interest in the challenges we are facing here in DeKalb County, a suburb of Atlanta. Once known as the city too busy to hate and commended for our excellence in education, esp. for poor and minority populations in a large urban area, we are now known for corruption that runs so deep you can’t even trust the PTA to stand up for the rights of the children (or even alert you to the fact that there might be a problem). Not sure what the final outcome of all this might be, but it sure makes for interesting reading, doens’t it? Sigh! If only it were a suspense novel and not part of our daily lives here! We could at least skip to the last chapter and find out how it was all going to end. Right now, it’s not looking very good for “our side.” But, when you have child you love and you couldn’t sell your home to move even if you wanted to, you have to put up the best fight you can and hope that doing the right thing will catch on. This has nothing to do with cell phone coverage – we have more towers per square mile than proably anywhere else in the U.S. It isn’t about education – our board can’t even decide what they are going to do with any of the money from these cell towers once it comes in. And, it can’t be spent on teacher salaries, books or capital improvements. We can’t even say for sure that it is about class warfare or politics as we have heard the same outcry from citizens across all possible affiliations and groups. Sadly, it appears that we are being held hostage by a few individuals with power who seek to reap individual financial reward at the expense of the educational future of literally thousands of innocent children. And, that is the least dramatic description I could come up with. Thanks for helping us spread the word and bring greater awareness to the subject of cell phone towers at schools and in residential communities. If it hasn’t happened to you, yet, then just give it a little more time. We will all be faced with this dilema sooner or later. We hope our website, http://www.GETtheCELLoutATL.org, will at least help the citizens get up to speed and learn about the tactics of their opponents faster so they will be better equipped to fight. You can also follow us on Facebook (Get the Cell Out – Atlanta Chapter). Emotion is the factor they expect to cloud your judgement, so the faster people can learn that this is a systematic, corporate takeover that is sweeping the U.S. and not an individual battle, the better they will be able to arm themselves with the facts and work within the time constraints to push back. The people in your community are basically like actors reading from a script (a pretty bad script that’s not even current with its facts and figures). They aren’t to blame personally, but someone is. We must learn to work together in order to call them out for pushing forward a corporate agenda so they will not continue to bully others and deny rights to taxpayers and children. Money truly is the root of all evil.